Home / Opinion / Political Columnist to Kris Aquino: "Dear Kris, I may not like you, as I find you too much of a brat.."
Political Columnist to Kris Aquino: "Dear Kris, I may not like you, as I find you too much of a brat.."
Sass Rogando Sasot, a popular social media personality and political columnist on Thursday, November 15, 2018, posted on her Facebook page, 'For the Motherland - Sass Rogando Sasot', and shared a screenshot of a comment made by actress Kris Aquino on her Instagram post. Sasot, a well-known staunch supporter of President Rodrigo Duterte, made sure that she answers the 'Queen of All Media', and fearlessly opened her heart and thoughts toward the actress. Her open letter to Kris says that she actually does not like the actress as she finds her a brat, yet, she regards Kris in a considerable measure of different ways. I may not like you, as I find you too much of a brat, but I respect you in a lot of other ways. ", Sasot wrote. Moreover, Sass Sasot disclosed to Kris that she is welcome to remark on her feed as they are in a free nation. "You are welcome to comment on my feed. It's a free country. ", she said. 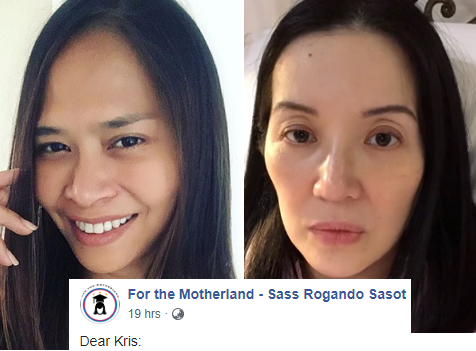 Prior to Sasot's letter to Kris, the latter allegedly posted a comment on Sasot's Instagram photo that says, someone has shown her Sasot's tweet about the allegedly ₱90K of cosmetics purchased with her production company credit card, Kris Cojuangco Aquino Productions (KCAP). The actress then made clear to the said comment that none of the cosmetics went to her or for the utilization of KCAP, thus, whereever it went remains a puzzle. Kris likewise apologizes to Sass for commenting on her post where she thinks she is not actually welcome, however, she added that she needs to give Sass the right figure of the cosmetics. 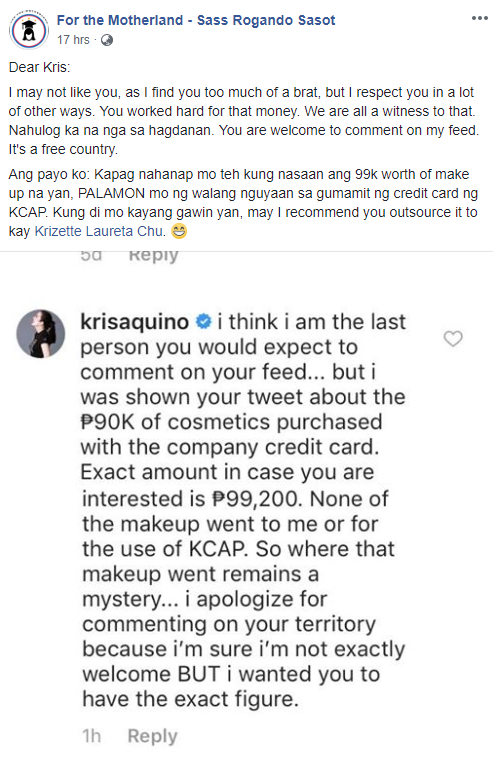 "krisaquino i think i am the last person you would expect to comment on your feed... but i was shown your tweet about the ₱90K of cosmetics purchased with the company credit card. Exact amount in case you are interested is ₱99,200. None of the makeup went to me or for the use of KCAP. So where that makeup went remains a mystery... i apologize for commenting on your territory because i’m sure i’m not exactly welcome BUT i wanted you to have the exact figure. ", Kris wrote. The tweet of Sass nonetheless, that made Kris Aquino reacted on Instagram was actually about the supposed unapproved utilization of Kris' credit card by the brother of an opposition blogger. "Part of the alleged unauthorized use of Kris' credit card by the brother of yellow blogger Jesus Falcis is over 90k of mac cosmetics. ", Sass tweeted. I may not like you, as I find you too much of a brat, but I respect you in a lot of other ways. You worked hard for that money. We are all a witness to that. Nahulog ka na nga sa hagdanan. You are welcome to comment on my feed. It's a free country. Ang payo ko: Kapag nahanap mo teh kung nasaan ang 99k worth of make up na yan, PALAMON mo ng walang nguyaan sa gumamit ng credit card ng KCAP. Kung di mo kayang gawin yan, may I recommend you outsource it to kay Krizette Laureta Chu."